When you have outdoor spaces on your property, you want to be able to use every part of them optimally. This is why you plan these areas and get outdoor features such as kitchens, patios, decks, pergolas, lawns, fireplace and fire pit areas etc. installed. But that also means some spots get segregated from the main spaces near your house. The one way to ensure that you are able to navigate across lawns is to get walkways installed at strategic points in different parts of the landscape. This ensures you have a firm and stable flooring to walk on and that you can access all the areas of the yard and garden without having to trample on any flower beds or turf. We at Rou Pavers are one of the leading companies in the hardscaping space and have created a distinct niche for ourselves in the industry. Our company has handled significant number of walkway installation projects for clients in and around Pensacola, Golf Breeze, Pace, and Milton. Our experts have designed and constructed impressive residential walkways on properties in Navarre, Navarre Beach, as well as Pensacola Beach. We are ICPI-certified installers and clients from across Fort Walton Beach, Baldwin County and the surrounding areas trust only us for all their hardscaping requirements. Our hardscaping experts work very closely with you to ensure the walkways on your property are designed in the manner you like. Today, there are a number of different materials that can be used in walkway installations such as concrete, asphalt, natural stone slabs and pavers. 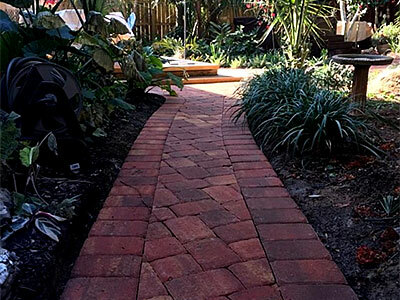 Most people prefer paver walkways and these are extremely resilient and durable. You can choose from pavers made of brick, natural stone or concrete. All of these have a distinct appeal of their own and are available in a variety of textures, shapes, sizes and colors. This helps you create the kind of look you want on your property. Paver stones are also easy to maintain and we can create different patterns and walkway layout in your landscape. The installation is quick and these units are set on compacted sand. We handle this job expertly and also install stone edging along the length of the walkway; this holds the pavers in place and adds to the integrity of the feature. We can also seal-coat the walkway surface of you like. This increases the resilience of the feature and makes it scratch and stain-resistant. Our expert walkway designers will give you all the information you need about the different types of walkway paving stones available and what their pros and cons are. This helps you make a more well-informed choice about the materials you want for your residential walkway. If you are looking for walkway installation contractors that will cater to your specific needs and give form to your ideas, we are the company to come to. For any more information on our services and walkways cost, feel free to contact Rou Pavers at 850-791-5641. You can send us your project details via this Contact Us form or request a free estimate and one of our experts will get in touch with you shortly.